To find out more, we took the opportunity of Sharp’s recent announcement that it has just sold five million phones with the mini digibox aboard to find out everything you need to know about 1-seg digital television. First, a little background - 1-seg, as it’s usually written on the actual hardware in Japan, is the part of the ISDB-T digital terrestrial television broadcast spectrum intended exclusively for mobile devices there. Of the 13 ‘segments’ that make up each digital channel, 12 are dedicated to full-bandwidth high-definition programming, leaving one to carry a much lighter mobile broadcast, which has become known as 1-seg. This MPEG-4 stream contains video, audio and interactive text elements, such as electronic program guides and information on each show, in a stream that weighs just over 400Kbps, making it ideal for relatively low-powered handheld devices. The fact that the highest possible video resolution is just 320 x 420 pixels underlines the difference between 1-seg and broadcasts for standard televisions. Impressive as the technology is, we can’t help wondering why watching TV on a tiny screen is so popular in Japan - after all, most attempts to deliver sports clips and the like to phones in the West have failed miserably. 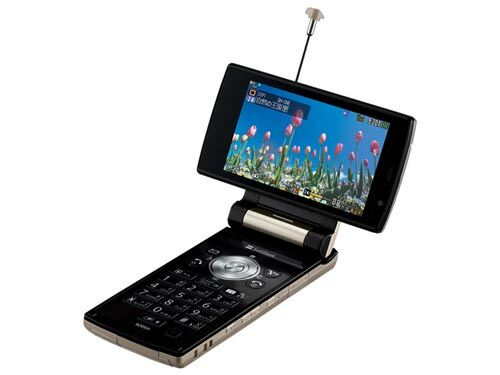 The Cycloid display (seen at the top on Sharp’s 920SH handset) is a nifty way to allow the screen to swivel through 90 degrees to present a landscape-oriented face to the user - it’s both practical and pleasingly tactile to play with - but we suspect Sharp’s world-leading position in LCD manufacturing is even more significant. 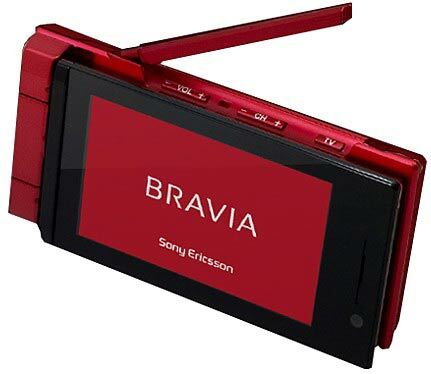 In fact, the Aquos tactic has been such an obvious success others have taken a leaf from Sharp’s book, with Sony recently introducing Bravia-branded phones (above) and Panasonic plundering its Viera intellectual-property cupboard to do the same. The facts are clear - 5 million sales by Sharp (but probably closer to 10 million now) and 20 million to the Japanese market as a whole by the end of 2007 - but who are the nerds watching these tiny TVs and how do they use them? Somewhat surprisingly, market research by Japanese analyst Macromill just over a year ago shows that almost half (48.5 per cent) of 1-seg viewers are in their 40s and 50s, with the under-30s making up just 27.5 per cent. Not exactly the geek crowd, is it? On the other hand, fewer than a third of users are women, although this may be connected to viewing location. Over 80 per cent of 1-seg watching is done either at work or on the way there by public transport. In traditionalist Japan, many women over 30 have left the workforce to marry and raise a family, which is sure to skew the figures towards their male counterparts. As for what people watch, news shows top the list at 75 per cent, followed by variety and sport broadcasts at around 35 per cent each (multiple answers allowed). Throw in the fact that only 15 per cent of viewers watch more than 30 minutes of 1-seg a day and it’s clear the typical user tunes in for quick catch-up blasts on the train or bus. Lastly on the statistical front, more recent research from MMRI tells us how important digital television is becoming. When asked in October this year if the presence or absence of 1-seg in a potential new phone mattered, only 9 per cent of those polled said it was not necessary. Of the remainder, a huge 67 per cent were actively seeking a digital television tuner in their new handset - not bad for a technology that arrived a little over two years ago. As you may have guessed, what’s good in Japan stays in Japan, but there are alternatives for inhabitants of the Western world. ISDB-T/1-seg, which works only in Japan and Brazil at the minute, is just one of many similar technologies. South Korea’s T-DMB mobile digital broadcasts are at least as popular there as 1-seg is in Japan, plus it is also in use in Germany. Speaking very broadly, the rest of Europe and the US already have or are about to get a format known as DVB-H, while China uses its own DMB-TH standard to achieve the same thing. Whatever happens with the technology, the single factor that will determine whether we emulate Japan and become a TV-on-the-go culture is money. Freeview works as well as it does in the UK because it’s just that - free to watch, just like 1-seg. Even though they receive no revenue from it, Japan’s mobile phone networks have embraced 1-seg because it brings added value to their handsets and thus to their customers, something that we think networks on our side of the world will realise sooner rather than later.